Exchange Server Store the information of user mailboxes in EDB File format. Whereas Outlook Application stored information in .pst file format. To import them into PST Format without any Power shell command or using any Exchange Server versions, known as Exchange Importer designed for this purpose. This Article deals with all the all features and advantages that help Exchange Administrator to import PST into Exchange Mailbox Database. Today Different Exchange Version used all over the world still, a tool able to data into them without any Data loss. Before explaining unique characteristics, let’s find the reason when we need to move the PST Data to Exchange Database Mailbox. Import multiple PST file into Exchange mailbox in Bulk or Batch. Support all the versions of MS Outlook & Exchange 2019 & below versions. Import PST into Exchange 2010/2013 Server Database: Complete migration PST File data such as Emails, Contacts, Tasks, Journals and Calender details. The local machine or the local network PST File also imported to the Exchange 2013 /2010. Search PST Files from the Network: The utility also provides the network searching option to browse the Outlook PST files from the network. To import PST file to Exchange 2010/2013 Database from domain network, a user can browse it with the help of Add file option. Import Selective PST Files to Exchange: Using Specific category to import them into Exchange Server can be used to save space in Mailbox. According to need user can select the items from Category of Emails, Contacts, Calendars, Journals and Tasks, and the tool will automatically Migrate the selected category items of PST File to Exchange Server. 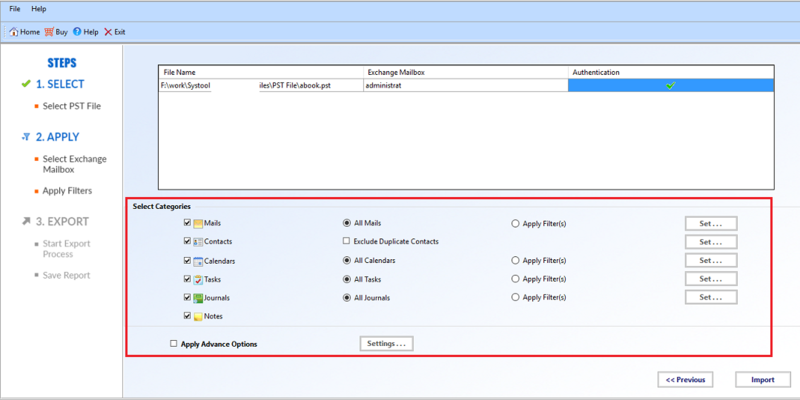 Exclude Duplicate Contacts: While importing pst contacts into Exchange 2010/2013, remove the Duplicate Contacts present within the Outlook PST file. This can be done by simply clicking on the option Exclude Duplicate Contacts. Import Calendar Files: With Exchange Import Tool, Administrator can select only the specific sections from the Mailboxes items such as “ Email, Contacts, Notes”. 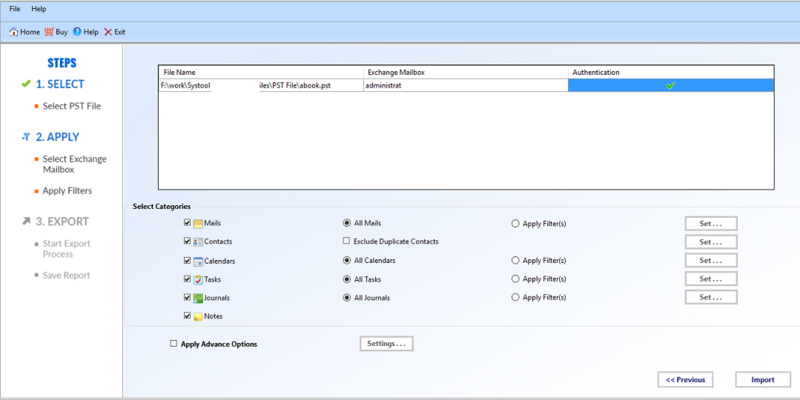 Even Administrator can import calendar from pst to exchange mailbox with separately. Date Based Filters: The software allows the user to apply the date filter on emails and other components like contacts, calendars, notes, journals, tasks. By doing this, only relevant data is exported and the rest is not. A user needs to specify “To” and “From” fields of the Date Range. Generates Status Report: Once the complete process to import PST files into Exchange 2013 Database is done, the tool will display the complete migration report. It will also show the current status of migration of emails and other components also. At last, a final report is produced. Mapping Features: While importing PST into Exchange 2013/2010 Server, to maintain the Folder Structure. Exchange Administrator needs to select an Advance Setting option & Map the Folder of PST File to Exchange Server Mailbox the help user to maintaining the Folder Hierarchy. Download and Install the Software in System and Open Software. Now Add PST via Two Option. a) Adding Orphan PST File by browsing the file stored in the system. b) Search PST File within the Network using Network File option. Now Provide Administrator Credentials and IP Address Details to import PST File data to Exchange mailboxes Database and Exchange Version. When Administrator Details get authenticated, a user needs to can select all category to export all data to PST file or select specific Category items to import into Exchange Mailboxes. Each Category, Specific Filter is available, a user can go for according to need. At last to Import PST into Exchange 2013 / 2016 Database or any other versions. Click on Import Button. Software Will Display Progress Bar Report While importing data and CSV Report also generated of Import Process. To import PST files into Exchange 2010/2013 Database Mailbox required by IT administrators in the various situation. 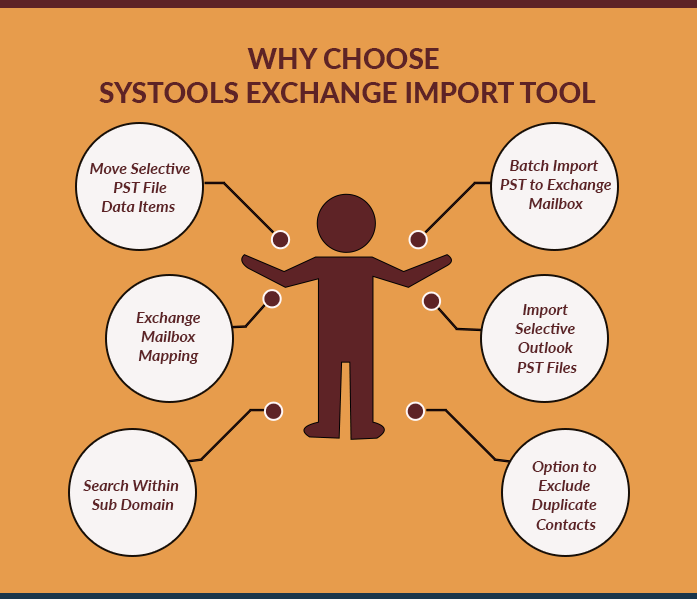 To do this, Exchange Importer is needed to migrate Outlook PST file to the Exchange Server. An Advance Tool recommended by Exchange Experts. The user interface of the tool is so simple that even a novice user can use it without any problem. Top 3 Proven Outlook Duplicate Remover Tools- Know the Best Tool Here!